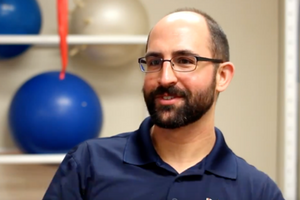 Dr. Ryan Rubio, PT is a Doctor of Physical Therapy at ACI Physical Therapy in Yanceyville, North Carolina. He also provides Physical Therapy services at our sister clinic, Danville Orthopedic & Athletic Rehab. Ryan is an expert at helping people of all ages recovery from orthopedic surgeries and injures. He is passionate about helping others get back to doing the things they love. He enjoys teaching patients strengthening exercises and performing manual therapy techniques to reduce pain. Ryan graduated in 2014 with a Doctor of Physical Therapy degree from the University of North Carolina at Chapel Hill, one of the top ranked programs in the nation. He also holds a Baccalaureate degree from UNC-Chapel Hill. Ryan resides in Danville, Virginia with his wife, Jessamyn, and their son, Raylen. Ryan stays active by running, lifting weights, practicing yoga, and exploring the Dan River Region with his family.